the heel bone. The largest of the tarsal bones, it articulates proximally with the talus and distally with the cuboid. Also called the os calcis. calcaneal, calcanean, adj. The largest tarsal bone, which articulates anteriorly with the cuboid and superiorly with the talus. It is the point of origin of the abductors of the great and little toes and point of insertion of the Achilles tendon. 1. [TA] The largest of the tarsal bones; it forms the heel and articulates with the cuboid anteriorly and the talus above. The heel bone, or os calcis. the irregular quadrangular bone at the back of the tarsus. 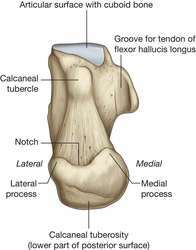 One of the two tarsal bones in the proximal row of bones of the hock joint and, because of its calcaneal tuber and the muscles attached to it, acts as a lever to extend the hock joint. Called also heel bone, os calcis, and fibular tarsal bone. See also Table 10. Caption: Figure 6 Radiograph on releve: os trigonum (Shepherd's fracture) behind the talus gets impinged between the tibia and the calcaneus. Moreover, the results show that beside BMI and Body fat%, all calcaneus QUS measurements showed differences according to physical activity level. Review of comparative studies between bone densitometry and quantitative ultrasound of the calcaneus in osteoporosis. These patients differ from forefoot varus in that the calcaneus does not go into excessive valgus (eversion). Variations of the talar articular facets of calcaneus in south Indian. Treatment of mobile flat foot by displacement osteotomy of the calcaneus. Controversies in calcaneus fracture management: a systematic review of the literature. 4,6,16) Examples of structures that can be compressed and can cause the development of symptoms are: an os trigonum (17), a prominent posterolateral process of the talus (4), an enlarged posterior process of the calcaneus (7), the posterior intermalleolar ligament (18), soft-tissue impingement (19), anomalous muscles (20), loose bodies, fractures of the ossicle or talar process, calcified inflammatory tissue, a low-lying flexor hallucis longus muscle belly and thickening of the capsule (7,8). The difference in these cases is that the patients had pain primarily with push off at the area of the enthesophyte and that care was taken to only and specifically inject the small area of tissue between the enthesophyte and the calcaneus. The peroneus longus tendon is located proximal and posteriorly to the lateral malleolus on the lateral surface of the calcaneus, cuboid (along the midfoot), and distally inserting at the base of the first metatarsal and medial cuneiform [1, 6]. It typically arises from repetitive microtrauma to the plantar fascia; a thick aponeurotic tissue that extends from the medial tubercle of the calcaneus to the proximal phalanges of the toes.